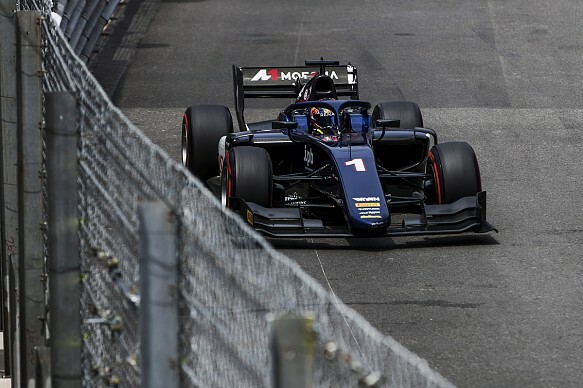 Artem Markelov took an epic Formula 2 feature race win in Monaco, as long-time leaders Alexander Albon and Nyck de Vries crashed in the pitlane. McLaren and Mercedes juniors Lando Norris and George Russell both had dramatic races, with the former extending his title lead despite causing a collision with Ralph Boschung, while Russell crashed out early-on. Markelov had qualified third with the benefit of a new chassis, after not being better than 15th in any other qualifying session so far in 2018. He held that position during the early running, while Albon and de Vries checked out up front, keeping each other honest with a gap that rarely went over one second. But on lap 14 of 42, the leaders pitted under the safety car caused by Norris colliding with Boschung, but Albon took a wider line into the pitlane as he appeared to make a late decision to come in. De Vries had nowhere to go and Albon was spun around after crossing the Prema Racing driver's front-left wheel. Both drivers got going again but later retired. Markelov therefore inherited an easy lead, but still needed to pit. De Vries' Prema team-mate Gelael was the biggest threat from outside the top six, as he had already made his stop to take on soft tyres. Markelov set about building a 25s gap to Gelael, setting a fastest lap late in the stint despite his softs being over 30 laps old. When he did come in on lap 35, he emerged in the net lead and went on to take victory by 10.7s. Gelael held on for second, ahead of MP Motorsport's Roberto Merhi, who took a sensational third place in the fragmented order. Charouz Racing System's Louis Deletraz, who started 14th on the grid and didn't appear to have the pace of team-mate Antonio Fuoco (who started fourth) this weekend, rose to fourth. Arjun Maini took his best F2 result in fifth for Trident, ahead of Norris, who was both a hero and villain during the race. Norris started 17th after a crash in qualifying and was edging towards a top 10 before he pitted. A few laps after he emerged, Norris crucially needed to pass Boschung, who had exited the pits on soft tyres. In a desperate attempt to get by, Norris punted Boschng in the rear at the hairpin and then optimistically dived down the inside of his MP rival at the final corner. Boschung was turned around and put out of the race on the spot, and Norris was given a drive through penalty for causing the collision. But he enjoyed clean air after taking the penalty and put in a string of fastest laps to rise back up the order and claim sixth place. Russell crashed out on lap eight attempting to pass Nirei Fukuzumi's Arden at Rascasse. He had started 16th and was working his way forward, but the move ended his day prematurely as he crashed into the barriers on the exit of the corner. Jack Aitken took seventh for ART Grand Prix despite running higher up for most of the race as his soft-to-supersoft strategy didn't pay off. Fuoco also given a drive through penalty for hitting Luca Ghiotto at the start - the Charouz driver cutting across the Campos Racing racer and breaking his left-front suspension, which left him stranded on the run to Ste Devote. Despite his penalty, Fuoco recovered to eighth and will start the sprint race from reverse-grid pole, ahead of Aitken. Nicholas Latifi and Fukuzumi rounded out the top 10.